If you haven’t examined your warehouse for the past several years, chances are that you should be able to improve productivity and perhaps even without the use of any capital funds. Depending on the type of warehouse, about 30% to 40% of the labor cost are allocated in the picking operation. First of all, going from an inefficient manual system to a sophisticated automated system is necessarily the answer. For a warehouse picking operation to be efficient, the office staff must prepare helpful picking lists. Getting an order from a customer and rushing it to the warehouse for picking may shows that something is happening fast, but in the long term, this approach usually wastes time and slows up the handling process. The office should go through a number of steps in preparing the paperwork as outlined below. The first step in improving the warehouse is to deduct each item from inventory. If an item is not deducted from inventory, the picker may spend time looking for it. The second step provided by the office should be to prepare a legible picking list with an exact location for each item. Third, each item on the picking list should be printed in the same sequence as it is located in the warehouse. If there is split picking for broken lots, full cases and full pallet items, the sequence should be broken out separately for each area. When the picking list is prepared, all out-of-stock items should be deleted. This will keep the picker from reading extraneous material and will save time. There is no one right way to pick. Every situation has to be examined for its peculiarities and special requirements. In a warehouse there are many variables which have an impact on picking. Some of it may be positive or may slow up the operation. A number of elements must be considered for effective picking. Generally the first element is to pick up the order. The second element is to read it. The third element is for the picker to go to the first item to be picked. The picker then picks that item. The next element might be to make a notation on the pick list. Then, he reads the next item, walks to that location, picks the item, makes a note on the pick list and repeats this sequence for the balance of the items. After the inventory have been picked, the items are brought back to a central point, laid down, and the order form need to be initialed by the picker. In most manual picking operations, 80% to 85% of the time is spent either walking or riding. The balance of the time is spent studying the order, making note and perform the actual picking. Travel time is dependent upon distance. One way to reduce distance is to slot the fastest moving items near the shipping point. If we follow Pareto’s Law or the 80-20 rule, and we put 20% of the items close to the shipping point, they may account for 80% of picking. Inventory placement is also an important factor. If a picker has to reach over six feet or below one foot, the work becomes more difficult. Inventory in deep bins or racks require reaching and perhaps climbing. This take times. Inventory that are wedged in or difficult to pull out also require time. Standard packs have an impact on time required to pick. If inventory have to be weighed or counted, additional picking time is needed. It is desirable to have pre-packaged, standard packs which need not be broken for picking. A related problem is that units or pallets may not have the same count for similar items. If this is so and the picker is aware of it, it takes more time to pick. If the picker is not aware of this situation, there will be picking errors. Picking methods can be different for different operations. For instance, one picker can make one pass to pick one order. This method makes sense when there are a few line items per order and the picking path distance is short. Several pickers may be used for a zone pick with each picker picking in a finite area. Zone picking is suitable for orders with many lines to reduce travel time. Batch picking may be used when many orders have the same inventory. In this situation, orders are totaled or batched, and the product picked as a batch. It is then brought to an assembly point for individual pieces to be separated for each order. Split picking is when different kinds of picking equipment are required to pick an order. Line inventory for an order are merged before or during shipping. Companies often consider their picking operation is efficient as long as their end products roll out on time and their customers are happy. However most picking operations in warehouses really could use a reorganization, and its all about the process, training, people, and systems. The following are some of the tips which need to improve your warehouse operation. The most popular inventory likely change with the seasons, so re-slot the warehouse to accommodate thebusiness model, and review the setup at least once a year. This ensures that the important inventory are in their correct storage and physical location, reducing unnecessary travel distance for the order pickers. The warehouse management system (WMS) should have a dynamic “slotting” module. Ensure the picking procedure suits the organization. Whether is it single order, multi-order, batch picking with a single picker, or zone picking, the correct picking methodology is critical for optimizing productivity. 3. 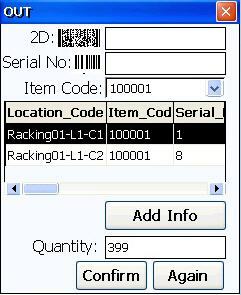 Use the inventory software to sequence orders. Sequencing the inventory orders by pick path, and batching together in a single line, same-zone orders, and difficult picks — such as non-conveyable items — saves tremendous time in the shop floor. A reliable inventory software should be able to organize the workflow, and optimize sequence performance. 4. Create a warehouse within a warehouse. The warehouse management should be able gain tremendous efficiency by grouping together the 20 percent of their inventory that complete 80 percent of their orders. It reduce the travel time for their pickers. Ensure that the 80-20 area or zone is properly designed to accommodate high-volume inventory movement activity. 5. Evaluate your storage equipment to ensure proper application. Placing slow-moving, low-cube items in bin shelving and fast-moving items in carton/pallet flow improves the storage density and productivity. However, please note that seasonal and other promotions can mess this layout. Some of the strategies to reduce cost and improve service level for warehouse. 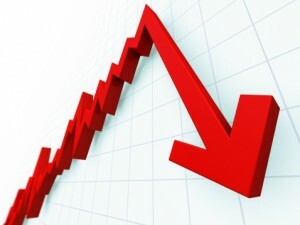 A program to set up internal benchmarks will reduce your cost per order or hold the cost in line as volumes increase. Translate these down to department and individual work standards. Labor is the largest controllable expense item in your distribution center. Successful practices to improve performance can lower your labor cost. Labor is your first or second largest expense after outbound freight in the fulfillment center. Review the reasons attrition is so high and work to close the gap. Review your hiring, retention and training practices. If possible, make use of a reliable inventory software program for the warehouse thus reducing labor and manpower cost. The fewer touches of product, the less cost of shipping an order. An effective warehouse cost reduction strategy is to streamline the operation and apply industry best practices in order to reduce the handling and cost of fulfilling an order. Effective slotting practices can lower your costs for picking, replenishment, and put away warehouse cost. Successful organizations take team building seriously. Take your organization to a new level and improve productivity. How can you use best practices to improve picking productivity? By using an inventory software with a Picking List optional is the best strategies as time and cost can be reduced instantly. This is a mantra in fulfillment today. Our operational assessments will help you get more productivity from your layout, space/product storage utilization and staff. By not caring for the basics of fulfillment, you are adding costs to the warehouse operation. Increasing current capacity and utilizing that capacity more effectively are key objectives. We believe that getting as much productivity as possible out of the existing layout, processes and systems will help you reduce warehouse costs. The saying of, “You can’t improve what you don’t measure” is definitely true. An effective measurement and reporting process can improve performance and lower costs. How can industry best practices help you improve performance and reduce costs of one of the most labor intensive functions in the warehouse? Controlling incoming and outgoing freight can make the difference between a profit or loss for your business. Are you “over inspecting” activities to the point of reduce returns and increase cost that does not result in a return on the investment? Cross docking is an effective practice to reduce handling costs while improving customer service. Returns cost more than orders to process. Untimely processing of customer credits, refunds and exchanges can damage customer service. Our assessments look at use of staff, people, space and systems to improve productivity. Many companies are still using Excel for monitoring their inventory. Excel cannot monitor and track your inventory easily. It is a tedious and time consuming tasks. Look for an inventory software which would perform this task easily. There are practical and cost effective reasons to outsource part or all of your business. It may be to deal with a peak, new product categories or when fulfillment is not a company core competency. ROI analysis could put automation into your planning for cost improvement. The wrong material handling equipment can be creating hidden lost time and inefficient product flow, impacting cost and customer service. This should include reviewing how bar coding throughout the warehouse, conveyance, material handling and warehouse management systems can improve productivity, increase service levels and reduce costs.. Effective inventory management is the single most important tool to improve customer service and reduce cost of operation. Effective replenishment is the basis of successful order fulfillment. Inefficient replenishment will cost huge dollars and negatively impact customer service. There are quite a huge number of small home businesses available in the world wide market today. To ensure the correct small home business inventory software being purchase, a proper planning need to be study careful. There is little room for error can be made especially when it comes to inventory. The most cost effective method to track of their inventory is by using a correct inventory tracking software. 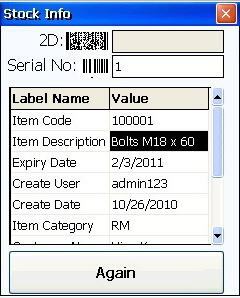 There are several essential items which should be included in the inventory software. Inventory software should include which items are moving out of the inventory and which items are still available, the levels of each item that is in stock, who is buying the items, what items are at a low level in the inventory, as well as any other specific services a small home business owner would like in their inventory software. Chronos Process Integration offers small business owners with an easy to use inventory software called eStockCard. This inventory software does much more than just track the items that are in stock. It actually tracks the item from the actual purchase order, to the supplier, and then to the invoicing and receiving payment from the customers. Before purchasing the software, it is very important that a small home business owner does the research about the inventory software and makes sure that the particular inventory software provides them with what they really need to track their inventory. Today, the eStockCard Team is so proud and excited to announce the release of Chronos eStockCard v3 Mobile Edition! After going through all the ups and downs in designing a better, easy to use and efficient inventory software, we are so glad that the eStockCard v3 Mobile Edition is finally launched. With this release, our eStockCard Inventory Software has reached an important milestone in creating a mobile version of the Inventory software which is yet to be available in the market today. Please read the Release Note below on what are the features available in the eStockCard v3 Mobile. IN – whereby the user would be able to store the item. Additional info’s can also be entered into the IN screen. This would be make storing of goods easily from any place in warehouse. OUT – whereby the user would be able to retrieve out the item from the exact spot of the item in their warehouse. 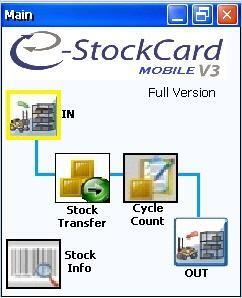 Cycle Count – Adjusting stock could not be as easy now with the eStockCard v3 Mobile. Stock Transfer – Stock can be transferred easily from 1 location to another location by just scanning on the original location barcode to the new location barcode. Stock Info – Need to identify the item in the warehouse. 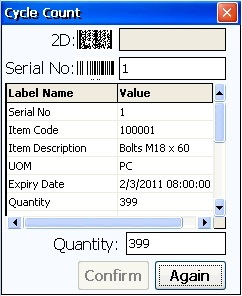 Just scan on the auto generated serial nos of the item and then item details would be shown instantly. To download the Chronos eStockCard v3 Mobile inventory software, just go to our download page to download the installation file. And as usual, for any supporting issues, please feel free to email us at support@estockcard.com . Thank you. In March, we have posted a Sneak Preview about the eStockCard PDA Version that we are going to launch this year. If you missed out this article, you can read it here. These few months, our team has been working very hard to develop this eStockCard PDA Version. There are so many things that we have to put into consideration such as what are the most suitable features to be equipped in this mobile edition and how we should name this new product? In the end, our team comes out with the name eStockCard v3 Mobile Edition. 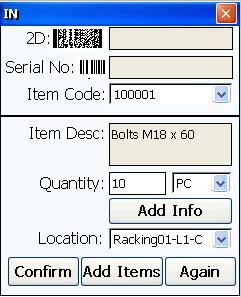 The reasons are simple, we are developing something so flexible and mobile that users can bring around their mobile computer barcode scanner to record the incoming and outgoing stock inventory in the warehouse via the IN and OUT easily either by scanning on the barcode label or just enter the quantity into the screen. In short, eStockCard v3 Mobile is designed to be flexible and easy to use. Here is the sneak preview for the eStockCard v3 Mobile main screen and you can see the features that we have in this new product. We will be launching this eStockCard v3 Mobile very soon so stay tuned with us for the latest updates and promotion. A productive warehouse is a money making warehouse. By ensuring the warehouse working efficiently, you can be assured of maximize your returns. You can improve efficiency by keeping up current machines, maintaining safe and comfortable working conditions . Take the efforts to assess what works to increase productivity, along with what doesn’t. Once all the strengths and weakness have been identified, then you can maintain them to ensure performance remains at a high level. Buy and install new equipment, such as forklift, lifts and computers. New equipment will ensure productivity. Further to that, it shows to the employees that you are invested in the business and is making their jobs easier. This increases morale, which has a positive effect on productivity. Review the warehouse locations layout. 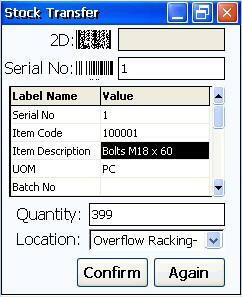 Stock inventory in a logical order and ensure they can be retrieved fast and easily. Make sure that inventory stock can be located easily. The longer it takes to find an inventory in the warehouse, the more time and resources are wasted. Enlarge the warehouse area. A larger area allows more room to store inventory stocks. A big and well-managed inventory can lead to higher profits. Expanding space also alleviates cramped and tight working conditions thus improving the workers morale. Increase top management personnel presence in the warehouse. Thus the workers would be glad to know that their managements are aware of their jobs and their importance to the company. In other ways, it also serves as a warning to less diligent employees that management is aware of their works performance. Provide a fair wage increment, if possible. However, if profits do not allow it, then find other incentives and rewards to boost the worker morale and work efficiency. Greeting from us at the Chronos eStockCard. We would like to announce that, as part of our company strategy to provide a better solution and greater support to our existing and future customers, the eStockCard v3 Business license would be discontinued and no longer available to be purchase from our website. The discontinue of the eStockCard v3 Business license is also due to the reason that its modules are currently available in the eStockCard v3 Premier itself. Thus, our customers will find that the eStockCard v3 Premier will be more suitable for their daily operation usage. However, for the existing customers of the eStockCard v3 Business, we assured that you will still receiving the necessary support from us. Again, we thank for all the support which our customers and users have given to us and we assure that we will continue to enhance the eStockCard functionality.